CHERRY BASKET is among the most charming of old-time favorites, and this version of pieced basket with applique handle is particularly quaint. It may be developed from the pattern in any color plan, but the old-time calico prints of which we cut it, red and yellow sprigged with a fine unbleached are exactly suitable. Blocks finish 12 inches square and one ready cut may be ordered for a pillow, together with back and boxing as No. 303X at 50 cents. If you have made quilts you surely appreciate what "ready cut" means. Ready cut quilts save you all the tedious marking of materials and endless cutting of hundreds of small pieces. The assortment comes to you complete, all of the pieces accurately cut of best quality percale, guaranteed color fast. A detailed chart shows exactly how to sew the pieces and quickly make up the quilt. Ready cut material for the whole quilt top to finish about 90 inches square includes all pieces for 25 patchwork blocks, the plain alternate squares and yellow print border 3 inches wide. This is order No. 303M at $4.50. 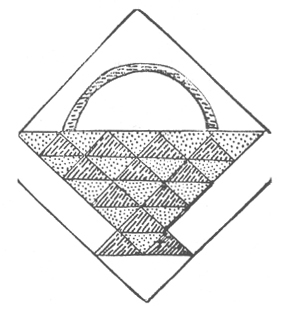 Instructions and diagram of complete quilt are included. Should you want the pattern only, it is in our patchwork pattern book No. 631C at 15 cents. 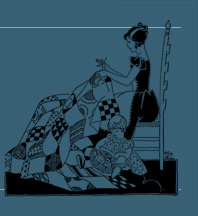 This book also contains eleven other well known quilt patterns.